Pick and Place toolhead, STL files included! Re: Pick and Place toolhead, STL files included! Edited 1 time(s). Last edit at 03/25/2011 04:36AM by VDX. Salvaged refrigerator/freezer pumps also make a nice, quiet source of vacuum. They come with an expansion room already, so oscillations should be very low. No issues with running them for weeks outside of their original place. Pressure range is about -0.8 to +12 bar, pumped volume is typically between 50 l/min and 150 l/min. If you want really non-oscillating vacuum, use a flow pump. Multi-stage ones can go below -0.8 bars as well, simple versions roundabout -0.4 to -0.5 bars. Can be made DIY, if you understand the principle. I've been working with a pick'n'place machine during one of my internships. In the following, I'll talk about a heavy duty industial pnp machine, but I think a lot of that could be applied to RepRap. Before the PCB was placed in the machine, solder paste was applied with a stencil. The machine was packed with several 'feeders', which in turn held the spools with the smd parts or the rails with the ICs. On two sides each, there was a row of adapters where the feeders could be hung in. The feeders where hardcoded and would register with the machine (What kind of part was in each feeder had to be inserted into the warehousing system before). So, the machine knew exactly what part was in which adapter, and had the position of all occupied adapters. The machine had two toolheads working in parallel, each of them able to hold up to five tools. I don't remember if they had different tools for different parts, but I think they were fitted with 3 different each. Anyway, the feeders were located below the toolheads, along the axis of movement. The toolhead would drive over to the correct slot, go down, pick up a part and go up again. With the part held, it moved over a camera, looking upwards, which controlled the positioning/orientation of the part on the toolhead. The machine would then move further, over the PCB. Which, in turn, was fixed on a movable table. This table could move perpendicular to the toolhead. Once toolhead and PCB were aligned, the part was put down. The populated PCB was then removed from the machine and put into the soldering furnace. Now, you might wonder ... how did they correct the position of the parts? Well, the machine had enough brains (and acuracy) to turn the parts into the right orientation and apply a delta to the final placement position. Unfortunably, I don't have any docs from that time left, at least none that I could disclose in public. 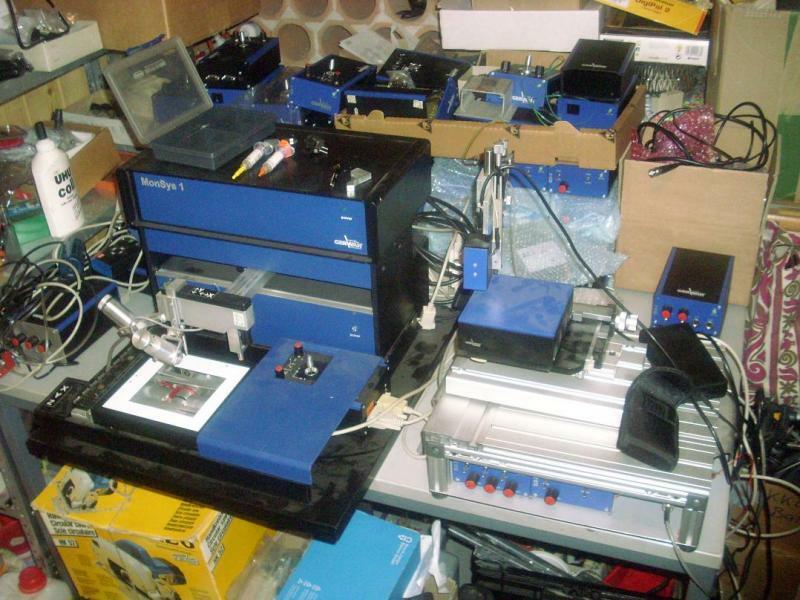 ... i have an older Fineplacer (see atached image) from finetech at home, that i've 'reworked' to a microassembly-station with two cameras and a separate cióntrollable XYZ-stage with submicron accuracy. SMD component placement accuracy is not critical if the pads are correctly designed. The surface tension of the molten solder paste pulls the components into position as long as the terminals are touching the correct pads. Sparkfun do a vac pump which might be of use rather than using an aquarium pump in reverse. As for webcams. Probably the best home use camera on the market at the moment is the Logitech QC9000. It has a hires sensor (True 1600x1200 not interpolated) and also has manual settings which is vital, which many cameras do not have. I have also stripped and fitted a "C" Type lens to one. The aquarium ones use a resonant armature, so are relatively quite compared to a DC motor, but they are mains driven. I think I will have a go at building a vacuum tool head, it looks quite straightforward. A dual head with solder paste extruder would be useful. Initially it might be human assisted to check if the basic mechanism works ok. To keeps things simple, I would present components in trays with small pockets to hold the components. It is extra work for the user to populate the trays, but I figure this will do for 1 or 2 off. I would then look at adding a CV system, and maybe tape feeders. This is an old thread but I stumbled across it while doing a Google search to see if there was a better gripper than what I had come up with. With 3D printing now widely available to help create custom project cases, I decided to turn my old CNC mill (which I used to mill connector openings in commercial plastic project cases) into a pick and place machine. As has been described here, I too rapidly discovered that the problem was not in the placing of the part onto the PCB but the accurate picking of the part in the first place. To that end, I believe I have developed a solution that will allow the same accuracy for picking as is available with placing and I should be able to put it to a test within a month. It's not an "elegant" solution but so far it's the best I've come up with. The reason I say it's not "elegant" is that it requires the user to manually preposition the parts ahead of time, a somewhat labor intensive process. However, If anybody is still listening out there, I'd love to share my approach. Who knows, maybe it will trigger a followup idea in someone else who is aware of something I'm not, and everybody benefits.